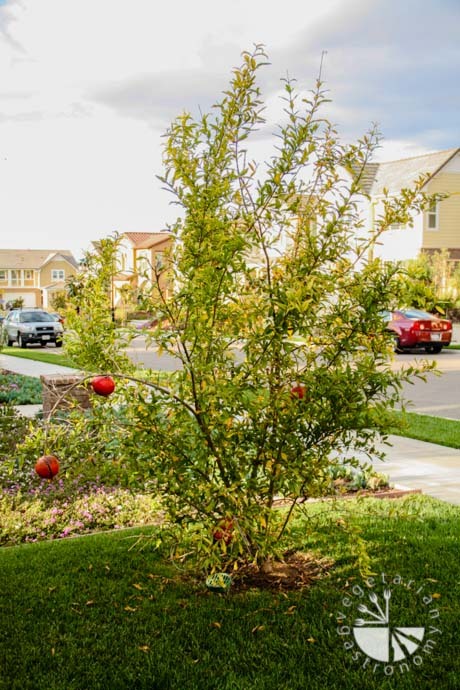 When my husband and I first moved into our current house 2 years ago, we decided to plant some fruit trees! Having come from families who grow fruits and vegetables in their backyard, we know how delicious home-grown produce is and the excitement of picking them as you need. My parents grow all kinds of vegetables including bell peppers, eggplant, tindora, etc. They also grow basil like a weed…it’s awesome! Many times after visiting them, I leave with some fresh home-made pesto in hand! My father in-law loves to garden. They live out in Palm Springs and grow all kinds of amazing fruits such as juicy oranges, dates (check out this post…), sugarcane, mangoes, pomegranate, etc.! They even own a sugarcane mill to make sugarcane juice! Getting back to fruit plants in our front yard…we ended up planting four trees: lemon, orange, grapefruit, and pomegranate. 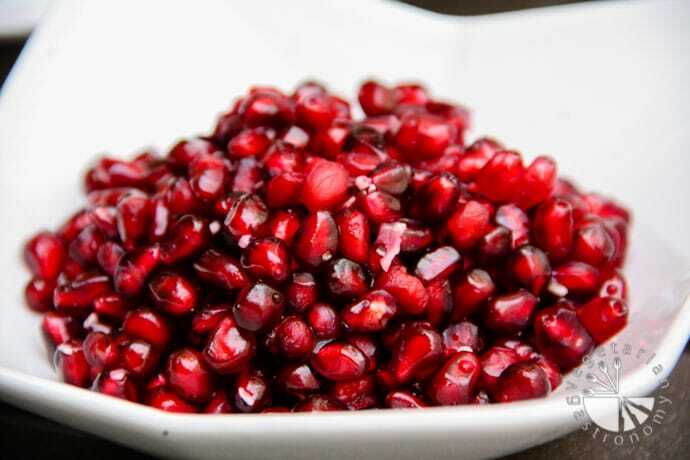 I love pomegranate seeds, but like most people, hate the task of de-seeding them. 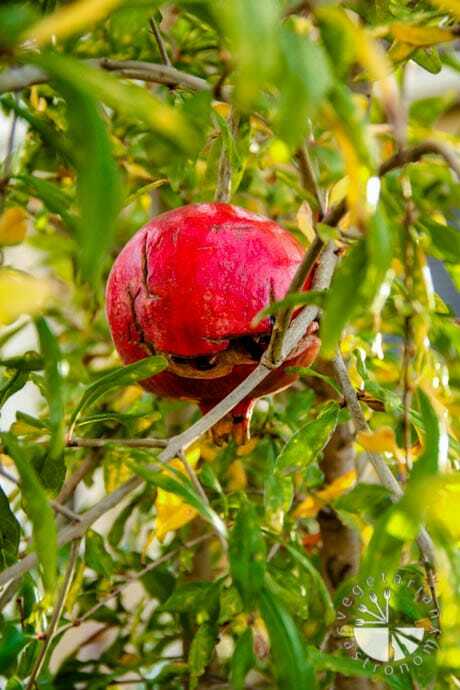 I even warned my husband that when the pomegranate tree finally delivered fruit, he would have to do the de-seeding! =) Our first year, we did not get any pomegranates, but this year, our tree delivered 7 of them. About a month ago, they seemed ready to be picked, but I procrastinated picking them because then I would have the laborious task of de-seeding all of them before they went bad! 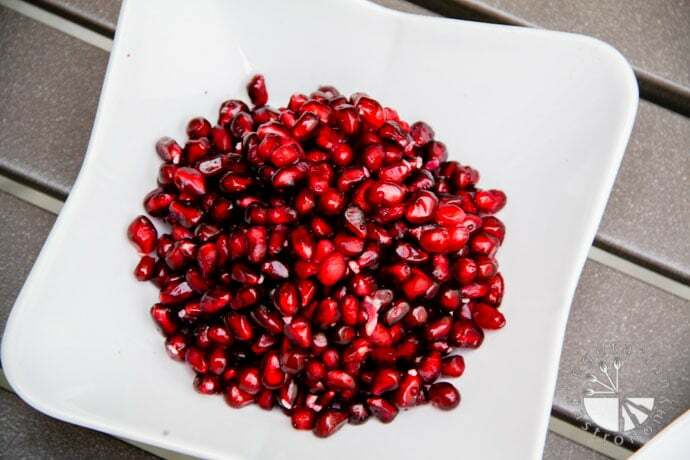 When coming up with our Thanksgiving menu this year (since we were hosting), I came across this delicious roasted acorn squash & pomegranate salad recipe that I really wanted to try. So the week before thanksgiving, I picked one pomegranate and brought it inside. There it sat…and sat…and sat…until finally the day before, I KNEW I had to de-seed it! Fates must have crossed and that same day, as I was searching through the internet, I found a video claiming how easy and mess-free it was to de-seed a pomegranate. 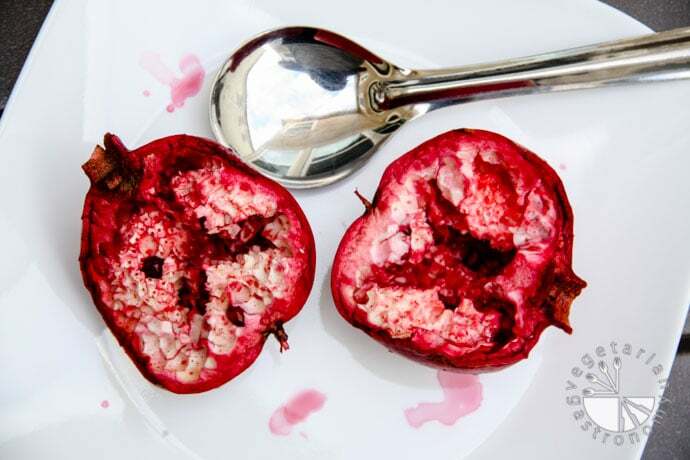 Skeptical, I gave the method a try, and in no time I had successfully de-seeded my pomegranate with little work and no mess! 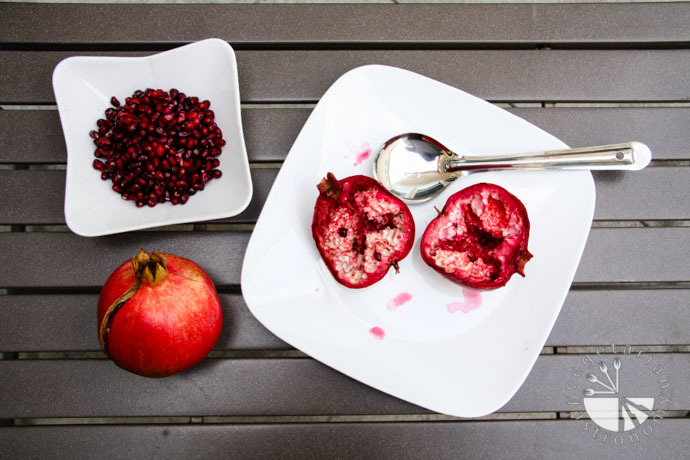 At that point, I ran outside, picked all the remaining pomegranates and de-seeded all of them that very same day! That’s how amazingly simple this method was! Cut the Pomegranate in half lengthwise. Fill a large bowl 1/2 way with water. Place it at the bottom of the kitchen sink. 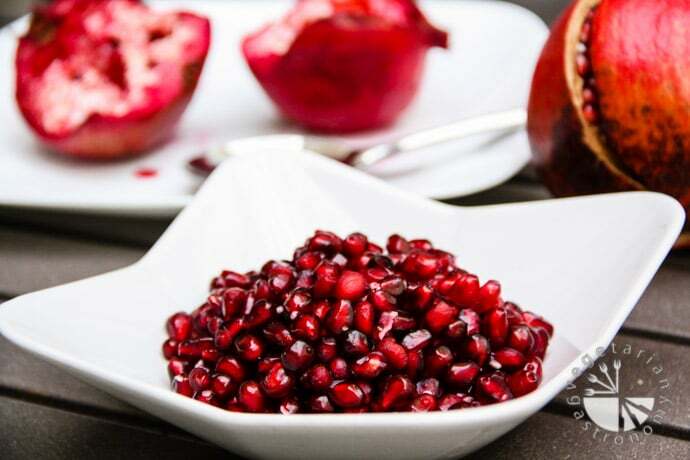 Place one half of the pomegranate cut side down in the palm of your hands over the bowl containing water. Using your other hand, take a solid spatula or large serving spoon (should not be flimsy) and start pounding on top of the pomegranate half. As you pound all around the top of the half, you should start to feel and see the seeds falling into your hand and into the bowl. 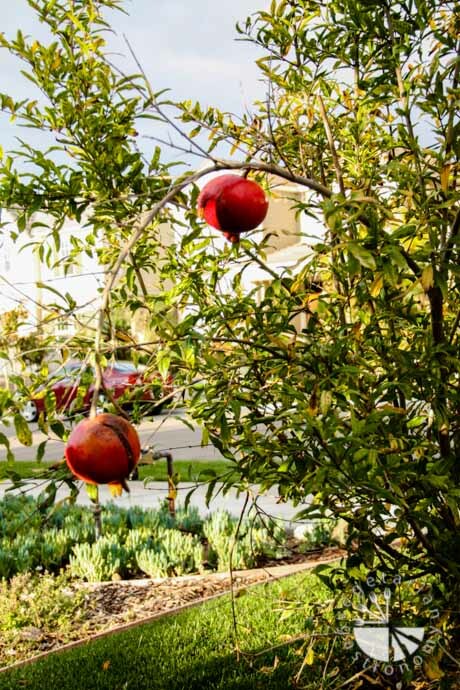 As the seeds start to fall, you’ll notice the pomegranate start to become pliable. At this time, slightly squeeze the sides as you pound on the top and you will start to see the seeds fall even faster. Continue until all the seeds have fallen out! 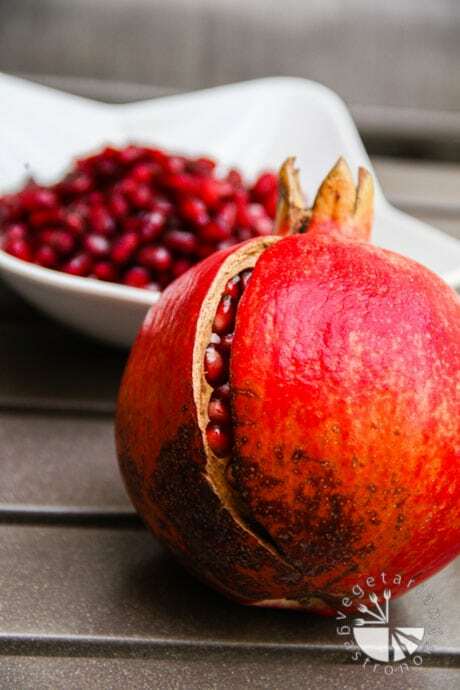 If you have a pomegranate sitting in your kitchen, I’d suggest you get to work and de-seed it today using this method! And if you don’t, I suggest you get one from the grocery store because I’m posting the recipe for the Roasted Acorn Squash & Pomegranate Salad later on this week and I promise you’ll want to make it right away…it’s currently my favorite recipe and I’ve already made it a few times since Thanksgiving!